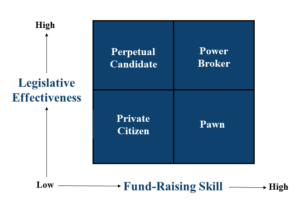 Each of your representatives in the United States House and Senate is either a Power Broker or a Pawn. There are no other options. This insight ought to scare the daylights out of you. When seeking to identify who really has power and controls any large, powerful organization, follow the money. First, a look at the fundraising fact. Let’s just say you woke up this morning and decided you wanted to become a member of the U.S. House of Representatives. Let’s assume that you and your resume are impressive enough that your national party organization – be it Democrat or Republican – assigns its very best campaign manager to lead the effort to help you land that dream job in Washington, DC. What’s the very first thing you’ll be told you need to do? If you aim for the Senate, the first task will be slightly different. First go get $11 Million. Keep in mind that these are just the average amounts raised by recent winning candidates. In a contested district, that number can go WAY higher. Jon Ossoff, the Democrat candidate, went out and got $30 Million. Seriously, THIRTY MILLION DOLLARS. That’s 15 times the average amount raised and 50% more than ever before in history. (The old record was $20 Million by Speaker of the House Paul Ryan in 2016). Ossoff’s Republican opponent, Karen Handel, the winner, raised “only” $7 Million – “only” 3.5 times the average. And that’s not all! So-called “Outside Groups” – as in “sources of additional funny-money not counted under campaign finance laws” spent another $7.5 Million on behalf of Ossoff and yet another $19 Million on behalf of Handel. So bottom line, these two characters raised over $63 Million dollars for a single election in a single Congressional district! Think about how much time and effort it takes to raise $100 for the Girl Scouts by selling the freaking cookies… Or to get $100 in donations for your local animal shelter… Or to raise $100 for any organization that’s important to you. Contrast that with the projected $1.1 Billion that will be raised by just the winning candidates for Congressional seats in the 2020 election. How much time and effort does it take to raise $1.1 Billion? Oh, and don’t forget about the roughly additional $750 Million cash that will get raised that doesn’t count under the current campaign finance rules! And all that just accounts for the winners! Think about this… The 435 people running for House and the 33 running for the Senate that will end up winning in the next election are hard at work right now – every day – scrounging up a couple of billion dollars. Ah, but after the win, they’ll all buckle down and focus on governing well, right? WRONG!!! Typically, 85% of Congress wins re-election, so guess what they do the day after they win? The fact of the matter is that roughly 60% of the members of Congress invest roughly 60% of their time – that’s 30 hours per week – doing fundraising. They each need to scrape together another $1.7 Million or so in the less than two years till the next election. The fundraising imperative never ends. Mid-Tenure: 20% of the members. Long-Term: 20% of the members. So that means at most 40%, about 100 people, have the potential to wield power. Now let’s divide that group in half according to ability to get things done. The lower half can’t get things done, and the upper half can. So that leaves us with about 50 people calling the shots in Congress. And of course there is also a power hierarchy among those 50. Assuming Congress is like every other organization on the planet, 20% or so of those 50 are truly in control. The powerful Power Brokers if you will. That would be 10 people. Thankfully they’re all saintly, sin-free, selfless public servants. Right……. 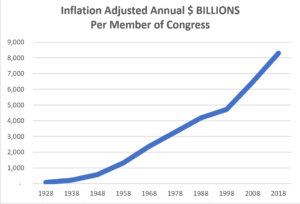 I recently did another episode titled The U.S. Congress and the Dunning–Kruger Effect which detailed how each of the 535 members of Congress – who approve ALL federal government expenditures – are responsible for approving the spending of $10 Billion taxpayer dollars every single year. Well… If it’s really just 10 folks calling the shots, those 10 each control total on and off-budget federal spending of $535 Billion each and every year. STOP!!! THINK ABOUT THAT!!! Is anybody really up to the task of managing a $535 Billion budget? That’s a bigger budget than the biggest Fortune 500 company, WalMart, by $50 Billion!!! So that tiny handful of people actually control Congress? Talk about centralization of power!!! 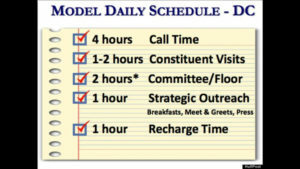 So… If you’re not already depressed, let’s examine a whole different aspect of power and control in the U.S. Congress. Let’s take a closer look at that 2017 special election for Georgia’s 6th District. If you’re not amazed, appalled and embarrassed at how smart you thought you were; if you see anything other than an overly confident, quasi-capable neophyte, you’re a world-class narcissist. Hell, I’m pushing 65, and when I look back at 55 year old me, I’m amazed at how much I’ve learned and matured. So back to Georgia’s special election…how does a 30-year old guy – with the painfully short resume and meagre list of accomplishments of any 30-year old – raise $30 Million? The answer is, he doesn’t. There’s a reason why 100% of the Senate and 98% of the House are over 40. I mean no disrespect, to the guy. He’s actually quite a bright fellow, and virtually certain to become successful. But make no mistake… That $30 Million came rolling in due to behind-the-scenes Power Brokers. The behind-the-scenes Power Brokers, found this attractive, articulate, photogenic young man who does not and never has even lived in the 6th District and threw themselves behind him. The Power Brokers wanted one more vote they could depend on. They would have continually reminded the young man that they were the ones who turned the money spigot on, and could just as quickly turn it off. Want the cash to get re-elected? Shut the hell up and do what you’re told! And why would the people living in the 6th District want a Congressman who doesn’t and never did even live there? The obvious answer is, they didn’t. He lost. But then why did the people living in the 6th District throw so much money at him. The much less obvious answer is, they didn’t. Only 5% of that $30 Million came from the Georgia 6th District. Only 14% of the total came from within the state of Georgia! 86% of his campaign donations came from out of state, and 95% came from outside the district involved in the election! People living in California donated more money to Ossoff than people living in Georgia. People living in New York donated more money to Ossoff than people living in Georgia. People living in Massachusetts donated more money to Ossoff than people living in Georgia’s 6th District. Our representatives in Congress spend more time begging for cash contributions than on any other single task. 60% regularly for more than half of their day, the other 40% often for more than half of their day. Money to fund campaigns considered significant by the Power Brokers is raised on a national basis. If you think your representative in Congress gives a rip a you, you live in fantasy-land. Face up to it! They care much more about raising money – from whatever the source – and/or cozying up to the Power Brokers. At a bare minimum, half of Congress – probably much more – are Pawns who got elected due to fundraising vs. legislative skills. That means only a small minority of Congress has any real power or influence over what gets done. It literally is likely that at most 50 people control everything that happens in Congress – not the least of which is controlling the spending almost $5 Trillion federal government dollars every single year. There has never been that much centralized political power ever before in the history of the world. I’ll repeat that last sentence… There has never been that much centralized political power ever before in the history of the world. I find that profoundly frightening. So what should we do? We could call for Dramatic Campaign Finance Reform. That would provide an opportunity for the Power Brokers in Congress to get lots of publicity about how they’re taking money out the political process and at the same time beefing up their own power and raising even more money. Campaign Finance Reform has been tried before repeatedly, and it DOES-NOT-WORK. Centralization of power like never before in the history of the world. The only way to reduce the powerfully pervasive influence of money on the political process in Washington, DC is to reduce the amount of money sloshing around Washington, DC. The best way to do so, in my humble opinion, is to demand that the Governors of each of the 50 states take back some of power (i.e., money) that has been abdicated to the federal government. The National Governors Association needs to be more aggressive in about not just slowing down, but stopping the growing centralization of power in the WashingtonU.S. Exactly how to do THAT, is a rant for another day.